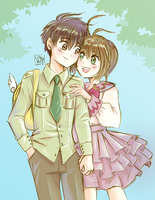 Inspired by the manga artwork style of Card Captor Sakura..! I kind of can’t believe I drew this… It’s been way too long since I’ve drawn something this shoujo. This will be a new print for SMASH 2016!! Do not reupload my art without permission/proper credit, especially on tumblr. I already have an account. If I see it I will report to have it taken down. 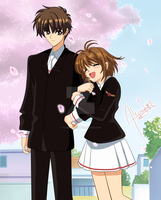 Oh my god I LOVE CCS! This is adorable! Absolutely love!!! It's outstanding. How long did this take to finish everything? I don't remember but I think about 8 or 9 hours! Thank you! I love their outfits. It so cute on them. I love this show. I binge watxhed it a few months ago and it made me smile. I was really sad to see it end. Ahh, it's perfect! Except for the frills. Not enough frills. Though to be fair, when it comes to CLAMP there's never enough frills. CCS especially is never enough frills hahaha..!!! Awwwww woooooooooooooooooooooooooooooooooooooooooooooooooooooooooooow *-* so cute and beautiful to, and the outfits look especially nice.